Photo: Ruby Tuesday in Cold Spring has closed after 15 years. Kristine Willike, Living Magazines. After nearly 16 years Ruby Tuesday, located at 5350 Alexandria Pike in Cold Spring, has closed. Opening in February of 2003, the casual chain with American fare, featuring burgers, a salad bar and cocktails closed on Monday, December 3. About 40 employees at the location received notification of the closure via email at around 8:30 a.m.
Christi had worked there for 15 years. She asked to not have her last name identified. The mother of six children, who lives in Falmouth, said the closure came as a shock. "The reason that we were given was it was a real estate issue. We got no notice as employees other than an email. It was done very quietly and sneaky," she told Fort Thomas Matters. Christi, who worked as a bartender and shift manager during her time at the Cold Spring location, said that business had been good lately. "We were up in sales for the year and doing better than any other in our district," she said. "It was a great place to work and although the way they closed was absolutely horrible, the last 15 years was my pleasure to serve our guests and work with some pretty amazing people." Employees were given the opportunity to transfer to other area Ruby Tuesday locations in Kings Mill, Kenwood or Milford and a small severance was offered to some employees as well. 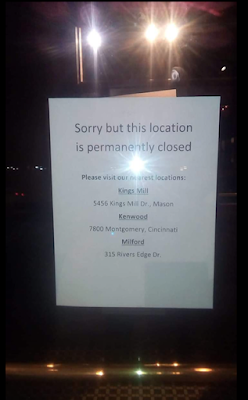 The Maryville, Tennessee-dining chain closed at least 20 locations over the last year as part of a “routine review of our store portfolio,” the company said in a statement. The closures continue the chain’s ongoing decline since its same-store sales began weakening in 2007. That year, the chain had an all-time high of 945 units. It began closing locations the next year, shuttering 44, and has been in decline ever since. The company's unit count declined by 17.1% last year, according to Technomic's Top 500 Chain Restaurant Report, to 558 locations from 673—a total of 115 locations. Ruby Tuesday now has 524 locations, according to the company, meaning the chain has shuttered 400 locations over the past 10 years. Ruby Tuesday was sold in December of last year to private-equity firm NRD Capital. I loved this restaurant Ruby Tuesday's!!!! Going to miss the people and that salad Bar!!!! My mom and I always loved going to Ruby Tuesdays in Tri County (Ohio) back when they served quiche... OMG they were sooo good!! Then they turned into your "run of the mill, same menu as everyone else" type of food chain.